TURNERSVILLE, NJ – SolarWorks NJ, LLC, a leading renewable energy developer, with proven expertise in designing, building, and managing small and large-scale renewable energy power projects, is proud to announce the completion of a solar installation at Advanced Benefit Services, Inc.
Advanced Benefit Services, located in downtown, historic Pitman has gone solar with a 17.625 kW solar energy system. The solar array will produce over 20,613 kilowatt hours annually, offsetting 85% of the company’s electric usage and cost. 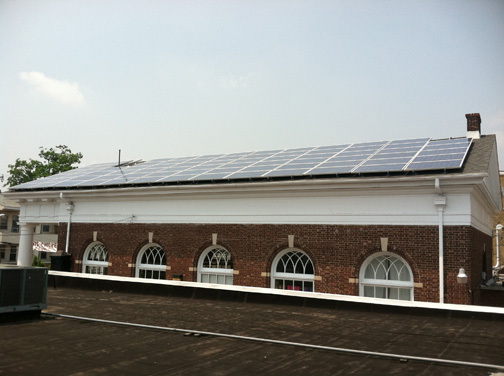 SolarWorksNJinstalled 75 Trina 235 Watt modules on the Southeastern roof. The array has a monitoring system that receives and stores measured values and data from the two SMA Sunny Boy inverters on site. The 30% Federal Energy Grant was paramount in Steve Smith’s decision to go solar. “As a small business owner, any proposal where the Federal government gives me money is one that will get me listening fast. Installation of solar requires a significant upfront cost, and to have a portion of that paid by government incentives made a big difference,” said Smith. Advanced Benefit Services owner, Steve Smith, is proud to be part of the continued revitalization of downtown Pitman hoping to create a buzz in the 2 square mile community of 9,800. About Advanced Benefit Services, Inc.
Advanced Benefit Services specializes in all types of Employee Benefit Programs. With over 30 years of experience, they have developed the most effective ways to save money on premiums, administration, and communication of employee benefits. SolarWorksNJ, LLC (SWNJ) is a premier solar energy integrator with offices in Turnersville and Denville, New Jersey and Wilmington, Delaware. Founded in 2003, SWNJ provides full-service renewable energy solutions to residential, commercial and agricultural clients in the tri-state area. SWNJ designs and installs solar energy systems. Ranked #1 by the prestigious Philadelphia100 and the NJ “Top 25.” Recognized by NJ Biz Magazine as “Emerging Business of the Year.” For more information please visit www.solarworksnj.com.